A few weeks ago I tried unsuccessfully to bake the no knead bread made famous by New York Times. It was embarrassing. No, it was more than embarrassing. As far as I know, I am the only person in history to bungle up this super easy idiot-proof bread pioneered by Jim Lahey. Never the one to give up, I changed tacks and put my faith behind the other no knead bread revolution taking over the food blogging world. I refer to Artisan Bread in five minutes a day, the book published by Jeff Hertzberg and Zoe Francois. The concept is simple enough - you don't knead the bread, but let the slow rise in the fridge do the job of gluten development. Here's the recipe, if you can call it one. Mix flour, yeast, salt and water to make a wet dough. Let rise for 2 hours until doubled. Then leave in the fridge overnight. Next morning, dust with flour and shape into a loaf. Let it rest for 40 minutes, then bake in a 220C oven for almost 30 minutes until the bread is golden. There are detailed instructions for steam trays and baking stones and whatnot, but none of these would fit in my tiny oven. I omitted all of that, and I even forgot to slash the tops before baking, but I still got a beautiful crust and an even texture. The authors don't give the exact quantities on their website, so I wouldn't either. But the idea is that you make enough dough for a week and grab just enough to bake a loaf every time you feel like it. Because of my earlier failure, I divided everything by 4 and only made enough dough for one loaf. And it's so good I am already starting my next batch. 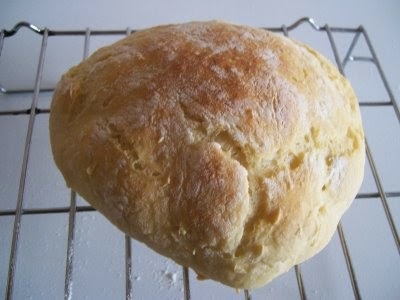 Have seen this bread on quite a few blogs..been wanting to try it anytime soon. Your verdict and pic is tempting me to try it soon. Thats a prefect bread..simply gorgeous! Lovely bread! I haven't tried this version..will give it a shot soon. Hey Simran, I just checked out a bunch on no knead breads on you tube this afternoon and seeing your bread I have decided to give it a try. This sounds simple,but looks so nice.Loved the look of the bread and considering it is home baked,it makes the bread more special isn't it? Don't feel bad--I had some issues with this bread also. Your successful loaf looks great. I have thought of re-tackling it, but my absurd need to supersize all of my one pot meals and stretch them out means I don't think I have a small enough dutch oven.